What Lies Ahead: Couples Drama, Body-Swapping and Taylor Swift in the next episodes! Last night's episode of Glee was a doozy, eh? But it was also the perfect setup for the last remaining episodes, which will surely be full of laughs, tears and, obviously, songs. Hope for Rachel's Future: "The next episodes after this really deal with the implications and complications," Murphy said during last night's Glee event at the Academy of Arts and Sciences. "The great thing about that character is that she just doesn't give up. That's a wonderful thing to write to, Rachel's tenacity. I think people love that about her, that she has a dream, even now. It's inspirational to a lot of kids to see a scene like that and not get what you want in the moment but to not give up. That's the idea of what the show is about." Kurt and Blaine Shake-Up? Even though Chris Colfer and Darren Criss both told us that Blaine and Kurt are "pretty solid," that doesn't mean they aren't itching for some drama for the duo. "[I'd like] an occasional shake-up, but they're a pretty solid couple," Criss says. "I don't foresee anything crazy happening to them anytime soon." His onscreen love echoes the want for conflict. "I love the drama," Colfer gushes to us. "Puppy dog love I can do without, let's get some drama in there!" Beiste Gets "Mean": Last night's episode was an emotional one for Coach Beiste when it was revealed she was in an abusive relationship with her husband, Cooter. But it sounds like she will eventually start fighting back, at least through song. "I do not proclaim to be any kind of singer," Dot Marie Jones said. "[But] in episode 20 Coach Beiste will sing Tayor Swift's "Mean" with Puck." Body-Swapping Fun: "Tina falls in a fountain in a mall and wakes up and everybody is someone else and it was the best thing ever," executive producer Ian Brennan previews. "Tina becomes Rachel, Kurt becomes Finn, Puck becomes Blaine, it's the greatest! Naya as Kevin is hilarious, and then Kevin as Naya is hilarious and Harry as Joe Hart…Harry in dreads is literally the funniest thing ever." Why a fountain fall? Because of YouTube, obviously! "There's YouTube video—because we're always stealing from the internet, where there's a woman and she's just texting in the mall and then falls in the fountain." To her credit, there is no Jenna Ushkowitz stunt double! "I do my own stunts. I was probably in the fountain about ten times," she laughs. 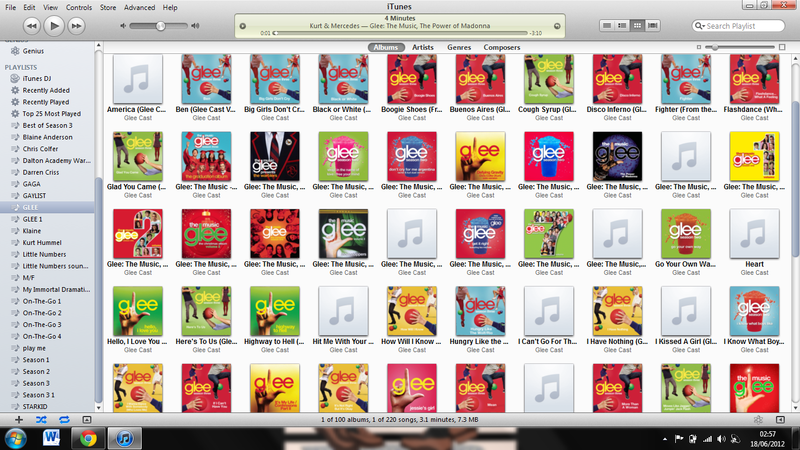 Ready for the final episodes, Gleeks? Learn even more about the next episodes here!